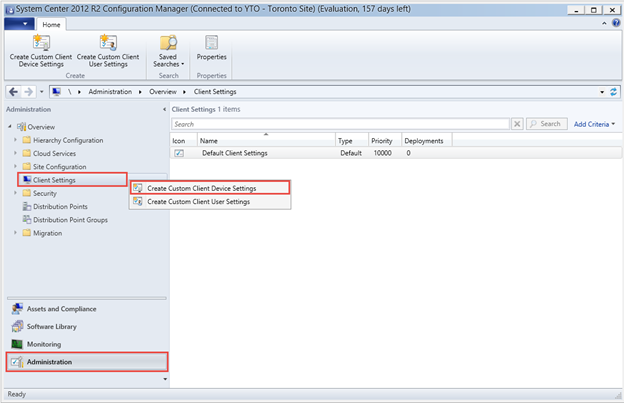 Client Settings are settings that can be configured to apply to all clients in a hierarchal manner. 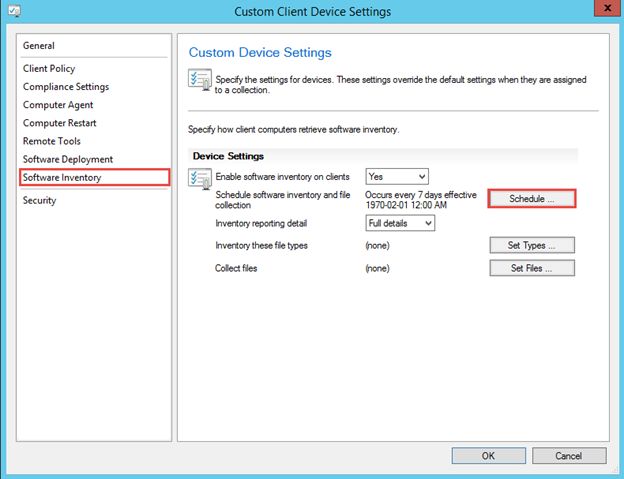 In SCCM 2012 R2, these client settings are organized at collection level which means we can specify different settings at different object collections. 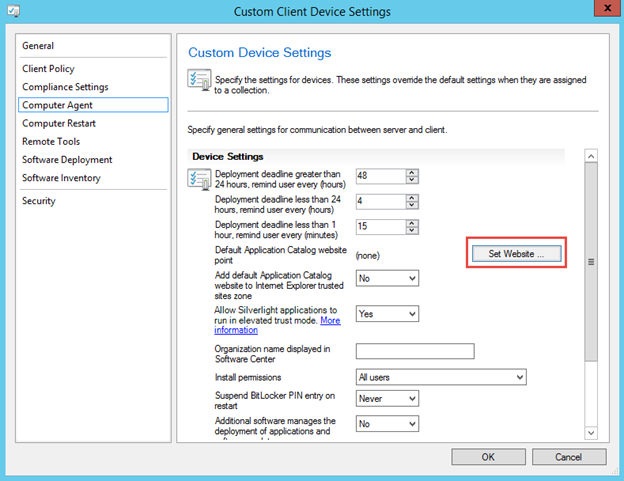 Client Settings have priority number, the smaller the number, the higher the priority. 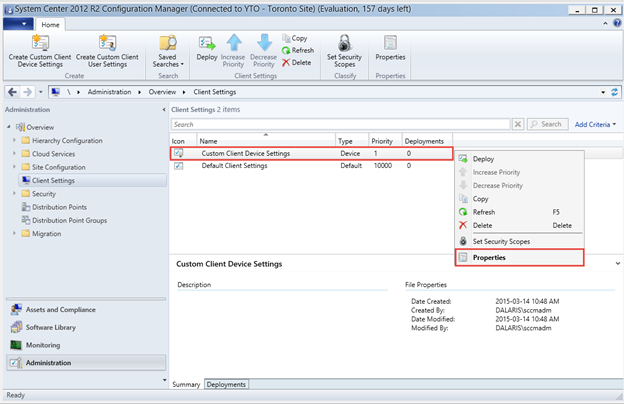 SCCM has a default client setting with priority value of 10000. A custom client setting you make with value of 9999 wins over the default one. 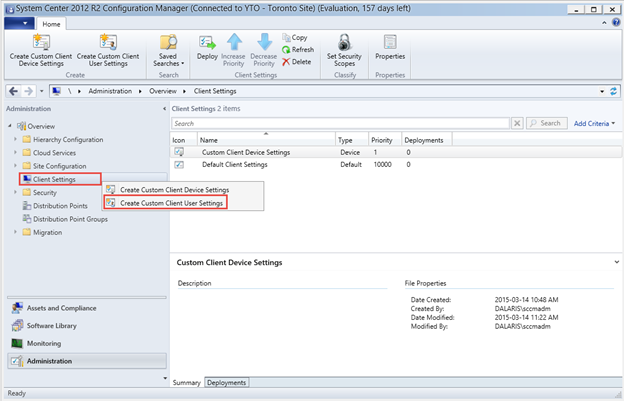 In Configuration Manager Console, click Administration, Right-click Client Settings, and choose Create Custom Client Device Settings. 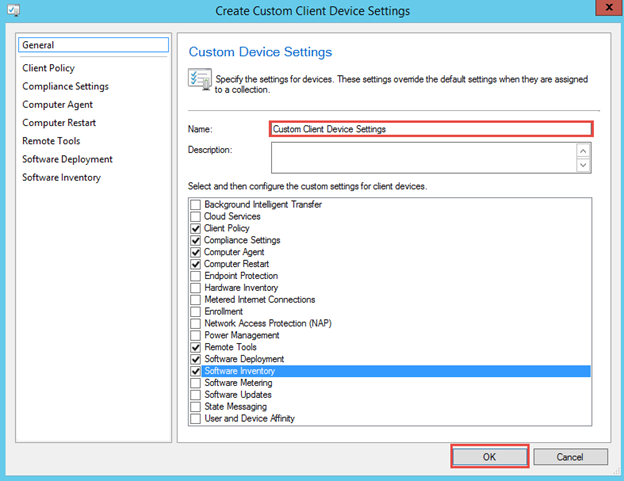 Enter a name for the Custom setting, choose the settings you need. 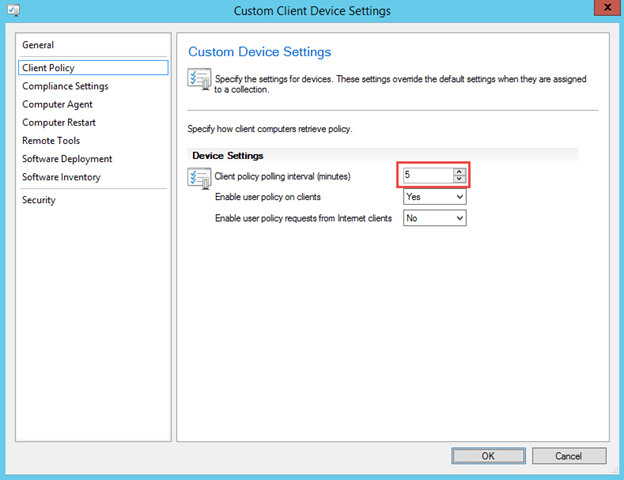 Then click OK.
Right-click on the newly created policy and choose Properties. 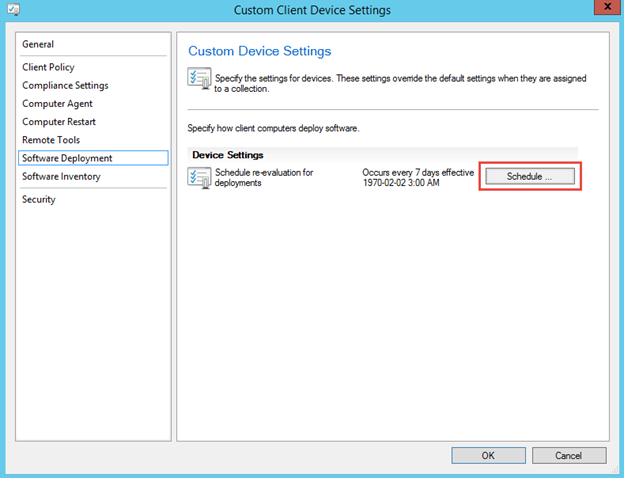 Client Policy specifies the interval in which the client computers will download client policy from MANAGEMENT POINT. In this lab, I will set it to 5 minutes so we can check the result instead of the default value of 60 minutes. 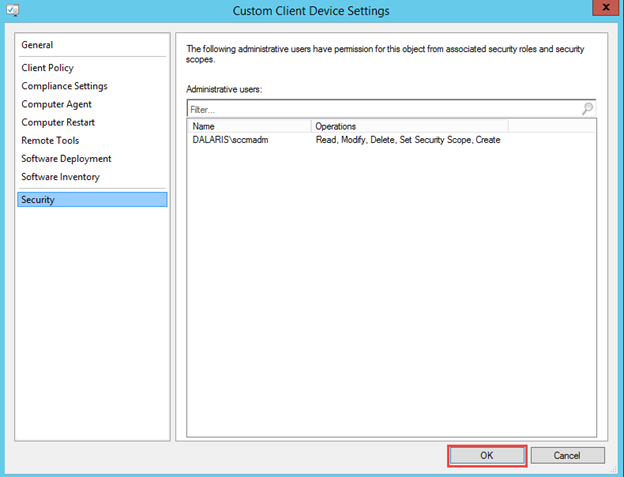 Click Compliance Settings and ensure the “Enable compliance evaluation on clients” is set to Yes. This ensures that the compliance evaluation happens on clients. Select Computer Agent then click the Set Website… button. 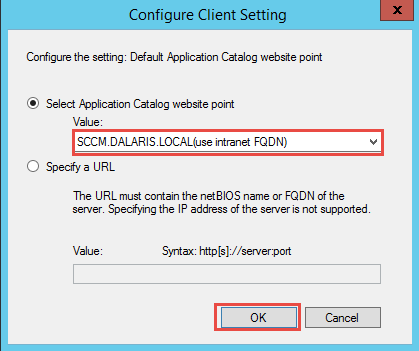 Choose Intranet FQDN and click OK. 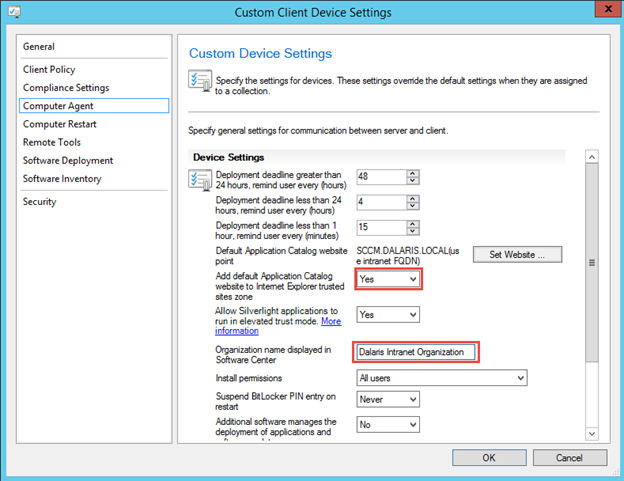 Choose to add the Default Application catalog web site to IE trusted site zone. Also enter a name for the Organization name to be displayed in Software Center. Computer Restart specifies how long the user can have to wrap up before the computer restarts. This restart is initiated by Configuration Manager. 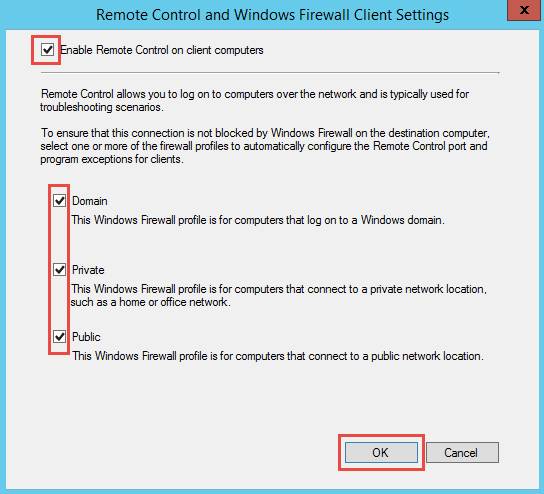 Remote Tool allows the administrators to remotely connect to client’s computers using RDP or Remote Assistance. 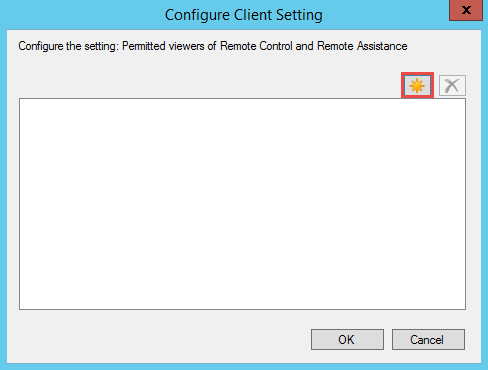 Click Remote tools and click the Configure… button. 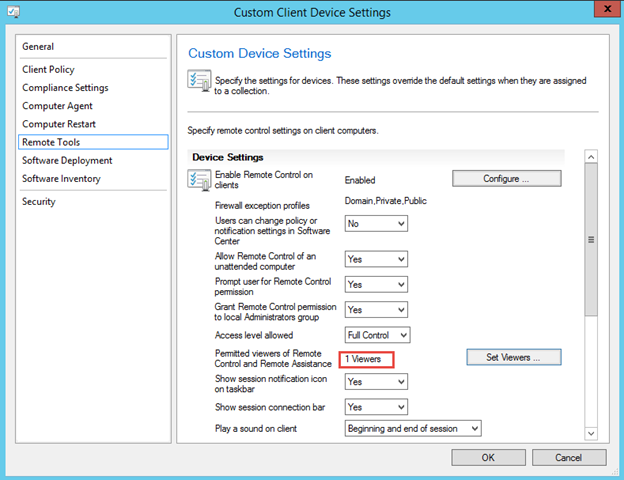 Choose to enable remote control for all profiles. 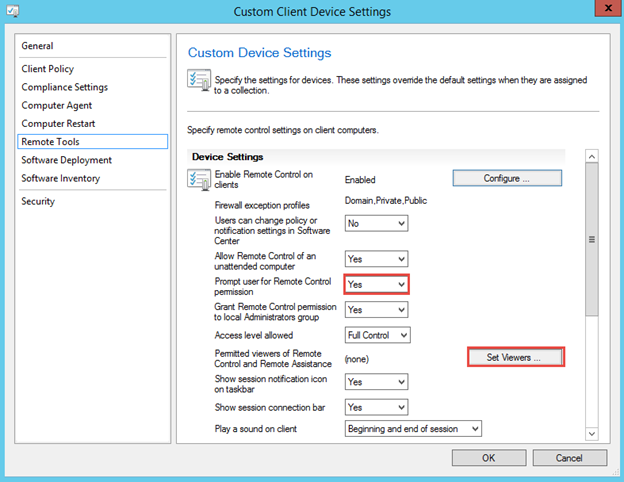 Select Yes to prompt users about the remote session. Also click Set Viewer button. Click the yellow icon to add users or groups. 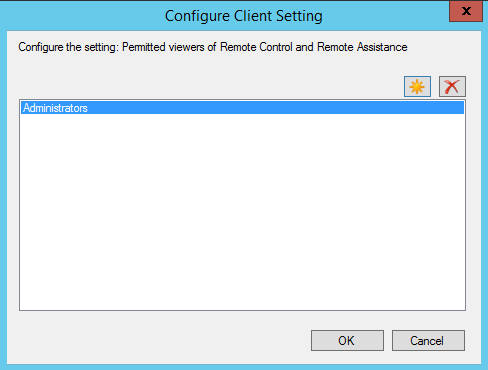 In this lab, I have added the Administrators group to allow them remote access. After you click OK you will see “1 Viewers” shown up. Software Deployment specifies how often software deployments are re-evaluated. By default, it is set to 7 days. Click the Schedule to change it to 3 days. You can choose Simple schedule or custom schedule. In this lab, I choose Simple schedule. 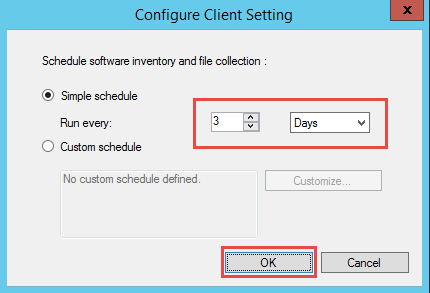 Click OK.
Software Inventory specifies how often software inventory takes place. 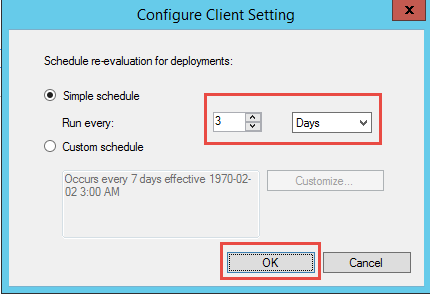 Change the default schedule from 7 days to 3 days. Use simple Schedule to set it to 3 days. Click OK.
Click Security to view for your information, click OK when done. 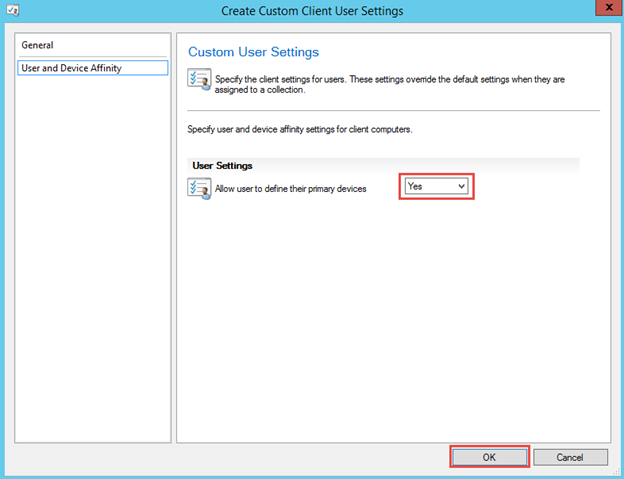 Custom Client User Settings: Now let’s create a Custom Client User Setting. 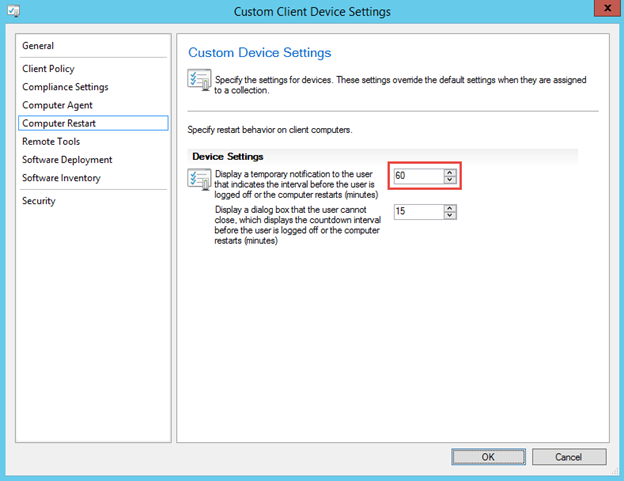 Right-click Client Settings in the CM Console. 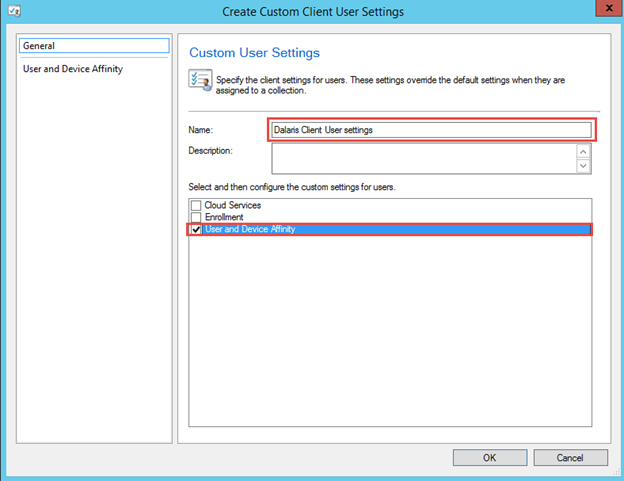 Choose Create Custom Client User Settings. 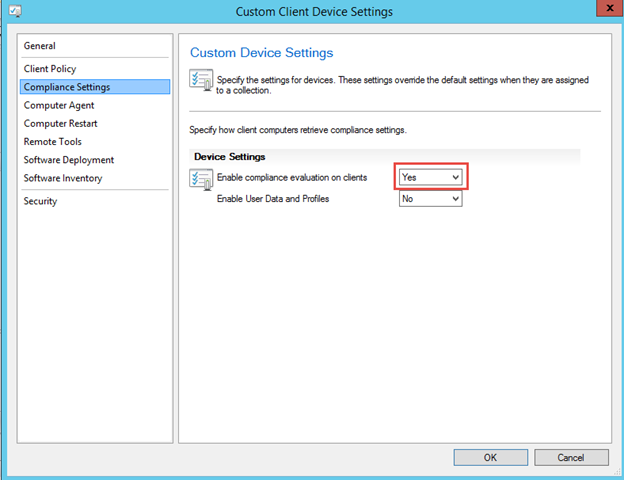 Select Yes to allow User to define their own primary device. Click OK when done. 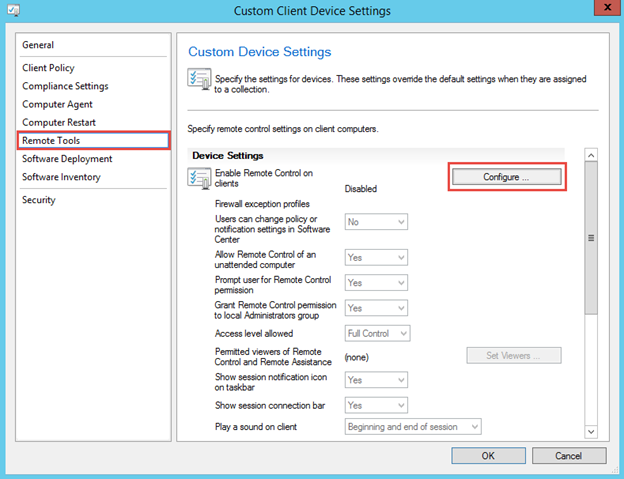 Now we have created two policy settings; we will have to push these policies to the clients once we have deployed the configuration managers to the client machines.